The Hershey Company is one of the most well-known companies in the United States, and its products are enjoyed all over the world. Its candies cover a large range of flavors and include the famous Hershey’s KISSES, Reese’s Peanut Butter Cups, Jolly Ranchers, Kit Kats, York Peppermint Patties, and Twizzlers. 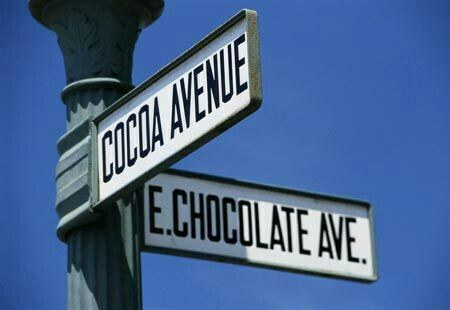 But how did this almost $19 billion company begin, and how does it influence the town of Hershey? The history of the company and the town of Hershey are very interconnected, since they were founded by the same person: Milton S. Hershey. Hershey got his start in the confections business from an apprenticeship at the age of 15. After his training, he had two failed businesses before beginning the Lancaster Caramel Company, which had moderate success. The popularity of his chocolate-flavored caramels led him to buy the machinery needed to begin making chocolate, and he soon decided to sell the Lancaster Caramel Company in order to create a new chocolate-focused business. The Hershey Chocolate Company quickly grew beyond what the factory in Lancaster could handle, so Mr. Hershey began searching for a new location for his business to expand. Instead of basing his new factory in a city, Hershey surprisingly chose to move back to the Pennsylvanian countryside where he grew up. He made this decision because of the abundance of farms that could supply fresh milk for his secret chocolate recipe. Workers began building the factory in early 1903. At this time, many manufacturers across the United States built towns and communities for their factory workers, and Mr. Hershey did the same. As the factory was being built, workers were also constructing a school and houses. 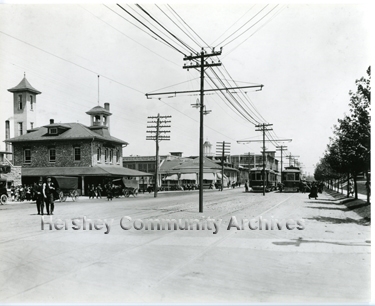 By 1905, the essential services for the town of Hershey, Pennsylvania were completed, including roads, a bank, a general store, public transportation, and electric, water, and telephone services. Mr. Hershey wanted his town to be a community, and so he encouraged the creation of clubs, sports teams, and a recreational center. One of the earliest attractions was Hershey Park, which began as a simple park for picnics and boating, but soon began adding activities such as bowling and a dance hall. However, what made Hershey different from other manufacturing towns is that Mr. Hershey also designed it to be a town for tourists. This unique town got lots of attention from the press, and as the business expanded, so did the town. By 1903 Milton Hershey had acquired over 1200 acres of land for his factory and model town. 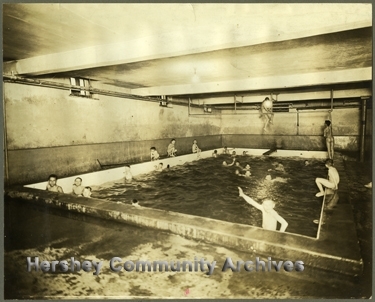 Hershey's first indoor pool opened in 1911. Swimming lessons were offered to both boys and girls. The town of Hershey fared well during the Great Depression, since Hershey had almost unlimited workers to carry out various building projects. These buildings, such as the Hershey Theatre and the prestigious Hershey Hotel, helped to improve the image of the town and made it even more appealing for tourists to come to after the Depression ended. The Hershey Chocolate Corporation (the brand had a name change in 1927) was very involved in the war efforts. 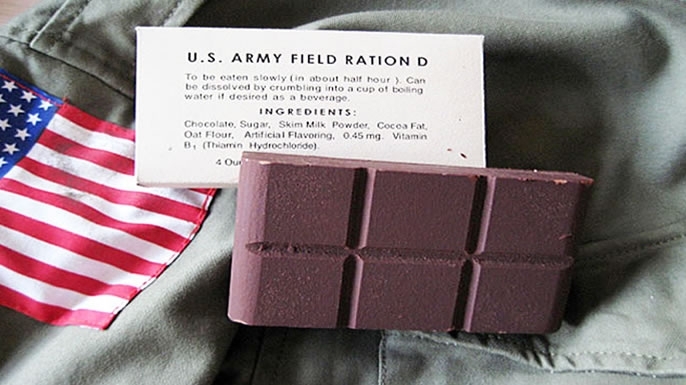 One of the company’s main contributions was the Ration D Bar, which provided a nutrient-dense food for soldiers. However, the bar did not taste very good, in order to keep the soldiers from eating them all at once. Another way that Hershey helped in the war was through keeping Vichy government officials in the Hotel Hershey. The Hotel was chosen because it was hard to find and would not have been a target, and it was also defensible. Also, it was a very nice place for the officials to stay. Many of them were able to leave before the war ended by claiming allegiance to the Free French Government. Then, they were allowed to seek political asylum in the United States. Another unique aspect of Hershey is the Milton Hershey School. Milton Hershey and his wife Catherine were unable to have children, so Mr. Hershey created a school where orphaned boys received an academic education and a stable home life. They also were trained in farming and vocational skills. There were 10 students that began in the year 1910, and it quickly began growing. After Catherine died, Hershey left his personal fortune to the school, and money from the profits of the Hershey Company still go to the school today. Now, the school has nearly 2,000 students (both male and female) who are either orphaned or come from low-income houses. The school is free for students to attend, and they live in homes based on age and gender, which are run by houseparents. Today, Hershey is a thriving town filled with chocolate-themed streets, restaurants, and tourist attractions. Hershey Park is now entirely devoted to roller coasters and amusement rides, and many park visitors also stop into Chocolate World, which has an informative indoor ride about the chocolate making process (complete with singing cows!). Visitors can also go to a museum about Mr. Hershey and the history of his company called The Hershey Story. There are also gardens, shopping outlets, and even a zoo. 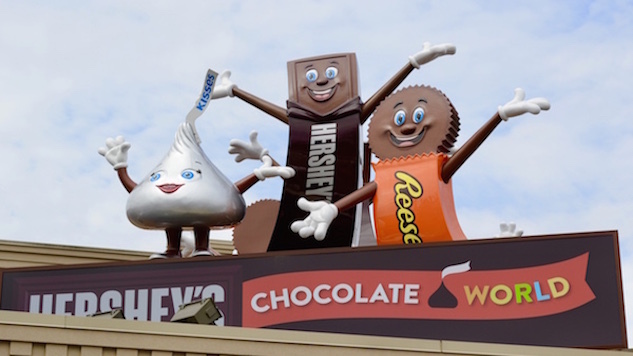 Many families go on vacation to Hershey not only because of all of the activities in the town, but it is also close to Philadelphia, New York City, and Washington D.C..
Interconnected: All parts of a system that have something in common, and thus work together. Manufacturer: Person or company that makes items in a factory. In the sentence, it was referring to the owner of the company. Essential Services: These need to be created for the people of a town in order for it to run. Houseparents: A married couple that lives with the students and takes care of their needs, organize special trips, help with homework, and teach the students how to do housework. Sydney Weidler is a sophomore (2nd year) student studying Nutrition and Dietetics at Messiah College, and is one of the virtual interns at America House this year! She loves travelling, reading, and baking, as well as playing the oboe and spending time with friends and family.